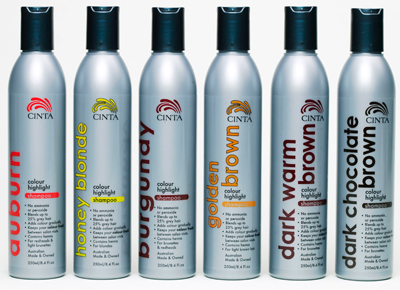 Coming in six tones - Honey Blonde, Golden Brown, Burgundy, Auburn, Dark Warm Brown and Dark Chocolate Brown - CINTA Colour Highlight Shampoos are specifically formulated to assist with maintaining rich and vibrant hair colour between salon visits. CINTA Colour Highlight Shampoos add subtle colour to hair every time it is used. The intensity of the colour builds with frequency of use, so ones desired colour can easily be controlled and maintained. For an intense colour boost, a generous amount of the shampoo can be applied to towel dried hair, left on for up to 30 minutes and then rinsed out. There are no gloves, colour mixing kits or mess to deal with. Using a unique dye system, without the damaging and drying properties of ammonia and peroxide, CINTA Colour Highlight Shampoos are gentle on the hair and are ideal for those with sensitive scalps, skin irritations or allergies. CINTA Colour Highlight Shampoos can be used on natural or previously coloured hair, and are also effective with blending and masking up to 25 per cent of salt 'n' pepper grey hair. A professional colour compliments the right haircut. With CINTA Colour Highlight Shampoos a professional hair style can remain looking fresh and lusterous for longer. CINTA has had a long history in Australia starting in Melbourne in the 1970's. Since its inception, CINTA has continued to manufacture in Australia affordable, high-quality hair care products that provide tangible results. The full CINTA product line includes ranges of shampoos and conditioners which tackle colour fading, assist with dry, fine or thinning hair, specialist Chamomile shampoos to correct yellowing for blondes and greys; as well as Intense Colour Sprays for fun at kids parties and sporting events; and the Australian Sun Sea Sport range, specifically designed for active sportspeople out in the harsh Australian elements. All CINTA products are tailor made to provide a hair care solution for the whole family. CINTA Colour Highlight Shampoos are available at Priceline and pharmacies, and retail for $9.95.